Here'a a guide on how to effectively farm Ryo, Scrolls and Pills, by using the Luck stat to increase the drop rates of items like Gama-chan, Rarer Scrolls and Pills. - Luck affects the drop rates of items during battle, and the only way to increase the Luck stat of your ninjas is by fusing dupes. 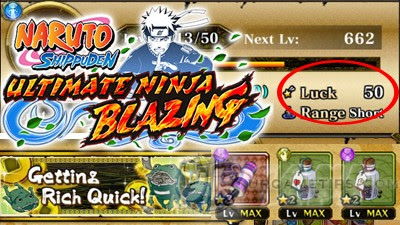 The Base ninja and Enhancing Materials to be used must have exactly the same name and title, even if they have different Lvls or number of stars. - Luck Stat is transferable, so instead of fusing all dupes directly into your maxed ninja, it is best to fuse all of your dupes first, then into your maxed ninja. This method will save you lots of Ryo. Why Ryo, Scrolls and Pill Bottles? - Basically, any stage missions that you can use "Auto Fight" will do. - The main reason is because the missions for these items are very easy to complete, and using Maxed 5* or 6* Ninjas is definitely an overkill. I would highly recommend that you should use any decent 4* or higher ninjas with high Luck instead to increase the drop rates. - When you are hosting stages, only accept Helpers with high luck ninjas (at least around 30 Luck "captain" ninjas). Use the "Room Comment" to notify other players. - Note: With the new update, other team Captains from Multiplayer mode will not affect chance rates of normal drop items, only the Lucky Drop. - Normal drops like items and characters will only depend on your team Captain's Luck stat. - Select "Gather Friends" option. - Under the "Select Team" section, go to the "Room ID Settings". - Select "Edit" to add a room comment, then continue. - Note: The room comment is permanent, so edit it again if you want to change or remove. - If you want to increase the drop rates of other items, you may also at least take 1 of your high luck ninjas as Captain of your team, then switch them during battle. - Use this as a guide to avoid over spending dupes. - There are common 3*/4* or 4*/4* ninjas that you can get from Summons with 10 Luck as their default stat. Fusing 3 of them into 1 Base will already give you a 3* ninja with 40 Luck. Awaken them to 4* to gain more. - This is the best option for F2P players too. - Every final mission of a Stage has a chance to drop a 3* ninja (1 Luck each). Farm and upgrade them to 4* if you like. - Luck also affects the drop rates of these farmable ninjas. - These are limited time event ninjas that you can farm from the Emergency Missions section. Check "Event Information" in-game for more info. - Upgrade them up to 5*, then farm more dupes to increase their Luck (1 Luck each). Note that joining Multiplayer Mode will also drop them! - The drop rate is constant per mission in this event (drop rate is dependent on the difficulty). - If you can reach at least Rank 10,000 at the end of the event, you'll be rewarded with a ninja that has a default Luck of 16. If you can win 1 more copy next time, then you can fuse them and get a 32 Luck total ninja. - Usually appears every weekends, then after the server reset (3 hours). - Complete these stages using 1 of your high Luck ninjas to increase the drop rates of Gama-Chan. - I believe the maximum that you can get is 4 pieces, but with a high Luck Captain, it is more likely that you can get 2 or 3 pieces of 3* Gama-chan items. - Same method above, farm the scrolls you need from their respective Scroll stages under Emergency Missions. Specific Scrolls will appear depending on the day. 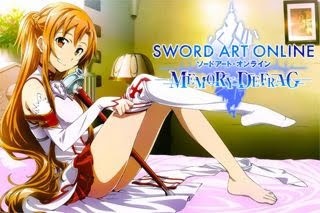 - All-Scrolls usually appear after the server reset (new day in-game) for 3 hours, and during weekends. - Join any story mode stage that you and your team can easily complete, this process might take some time, but hey it's free! - Earn Completion Rewards for collecting all characters and items dropped during Missions, as well as the Lucky Drop (if available for that mission). - The all-new Lucky Drop is a chance to earn more characters and items depending on your Captain character's Luck! See if you can get it on the Missions Results Screen.